BRIGHOUSE TOWN manager Vill Powell believes that the race for the title in the Evo-Stik East is now a two-way fight. Third-placed Pontefract Collieries were surprisingly beaten 7-3 at Spalding United last Saturday and stay five points behind Brighouse while falling 11 behind leaders Morpeth Town. 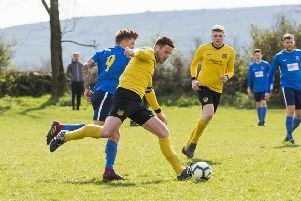 Former Sheffield Wednesday striker Powell feels the current leaders cannot be caught by the sides below Town and he has no intention of letting his own side’s standards slip. Brighouse had a break from action last weekend but return with a home clash against Marske United on Saturday. “We must not get heady about this and we must also keep playing each week and be focused,” said Powell. “After being without a fixture last weekend, it is imperative we get back in action this weekend and keep playing to the standards we have set ourselves. “Not only for the momentum but also for the mentality of the players and keeping the edge on match fitness. This weekend’s visitors have not had the best of starts to 2019 but they bounced back last Saturday with a 5-0 home win over Lincoln United. They had previously lost 1-0 to Pickering Town on January 1, lost 2-1 at home to Loughborough Dynamo and then drawn 0-0 with Stocksbridge Park Steels. Manager Carl Jarrett has brought former academy goalkeeper Luke Mewitt back on loan from Huddersfield Town.